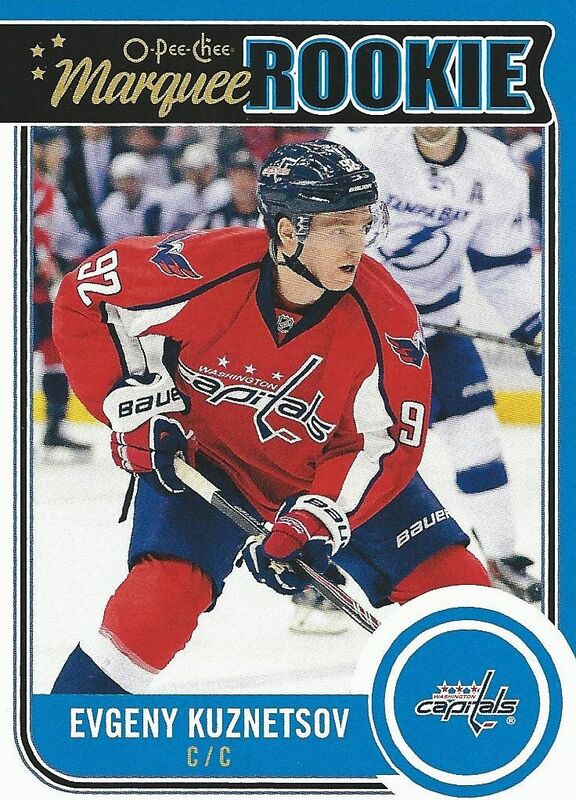 Upper Deck's second product for the 14/15 season is O-Pee-Chee, one of the most recognized brands in card collecting. O-Pee-Chee has been around for ages, and I'm glad it is still being made today. This year's product comes in a similar configuration to last year's. 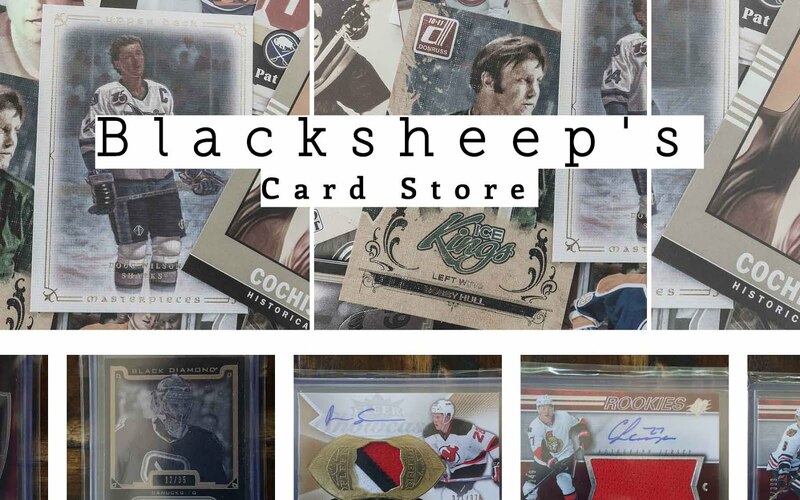 It'll be fun to see what designs Upper Deck has implemented for the product this year. 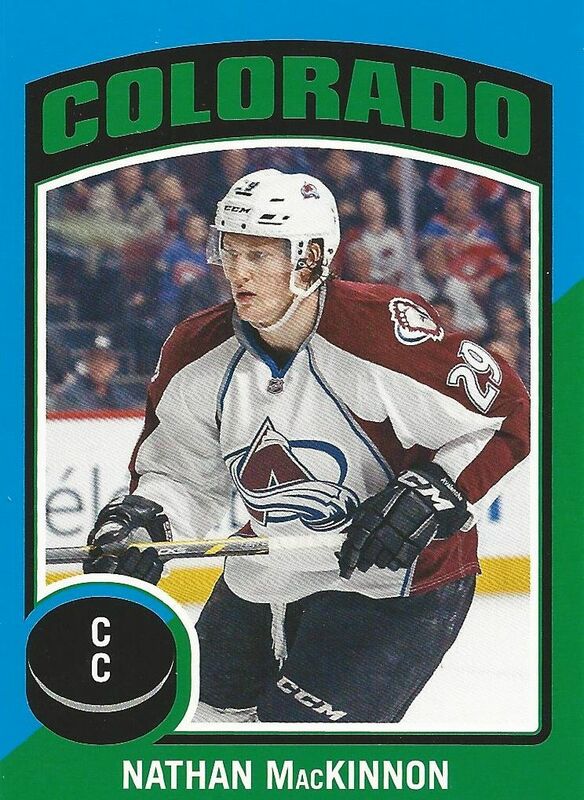 O-Pee-Chee cards have always used looks that have a touch of retro-influenced design, and the same can be said of the cards this year. The cards have white borders with large graphics framing the player photo. The cards give a sense that these are what cards would be today if companies had continued their designs without much change throughout the years. I like that. It's a great call out to the old school. 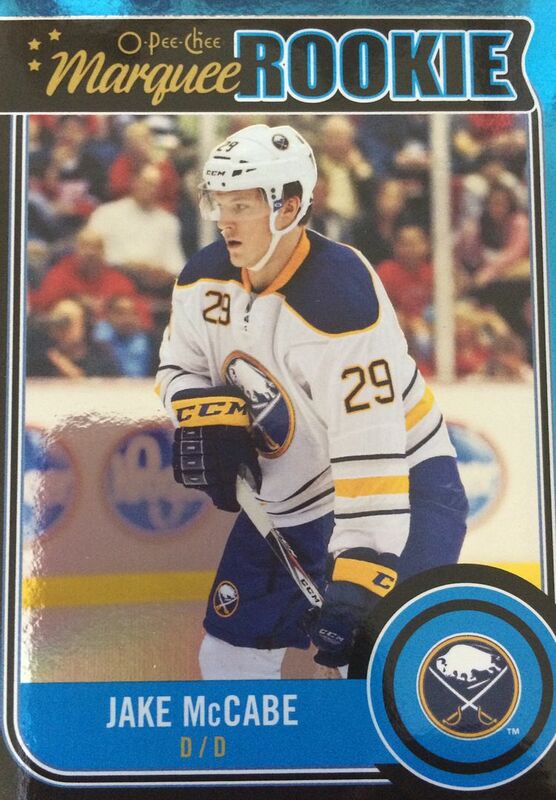 I only wish that Upper Deck would use better photos on these cards. Last year, you could really tell Panini upped the photo selection in their low-end release of Score. Most of the photos in OPC are plain and vanilla. I guess it goes with the retro theme, but even back then there were some cards that really stood out because of the photo on the front. The back of the base card is full of brown cardboard goodness. It's so pleasing to see the cardboard color when flipping over the base cards. Unfortunately, there's not much to the base card backs. There are the stats and vital information, but that's it. There's no fun elements or write-up to fill out the card. Old sets did have fun things thrown in to the back designs. That's something these cards should have as well. 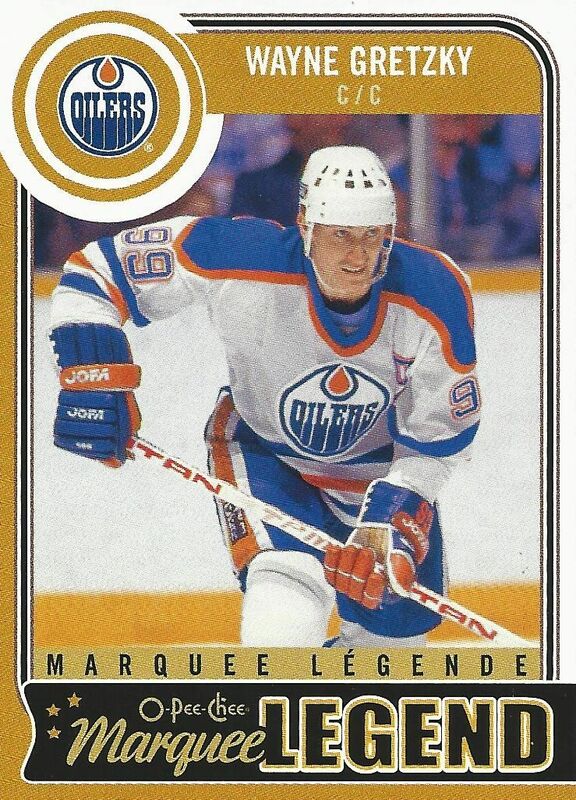 Marquee Legend subset cards make their return this year, and it's a way that OPC has found to put retired players and coaches into the set. The golden color used heavily on the card makes them stand out from the standard base card, but the overall design is unremarkable. The rookie cards this year are great though. Unlike the pedestrian design of the Marquee Legends, the Marquee Rookies have a bright design that really pops. The laser blue colored borders give these cards a great visual appeal. Out of the main set of card, these rookie cards are the best looking of all. Getting hits out of O-Pee-Chee is no guarantee. In fact, I didn't get a hit from the box I opened up. 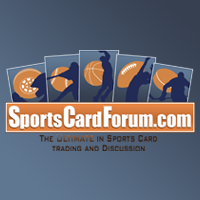 But collectors can find autographed cards and team logo patch cards that have been popular from the past. Parallel cards, foils, and other inserts are also part of the OPC experience - and got plenty of these types of cards. 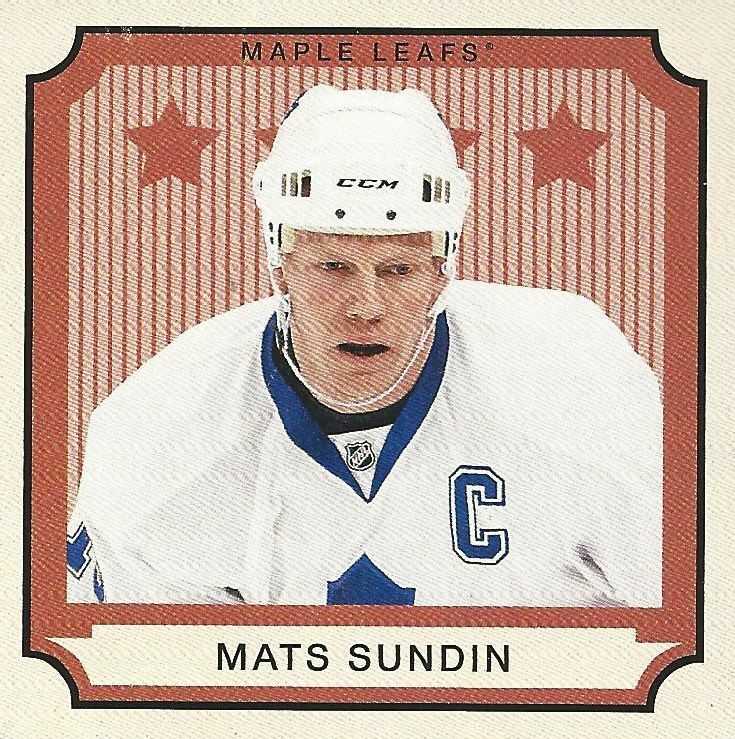 Each pack of OPC will contain a retro card that looks even more retro than the base card. 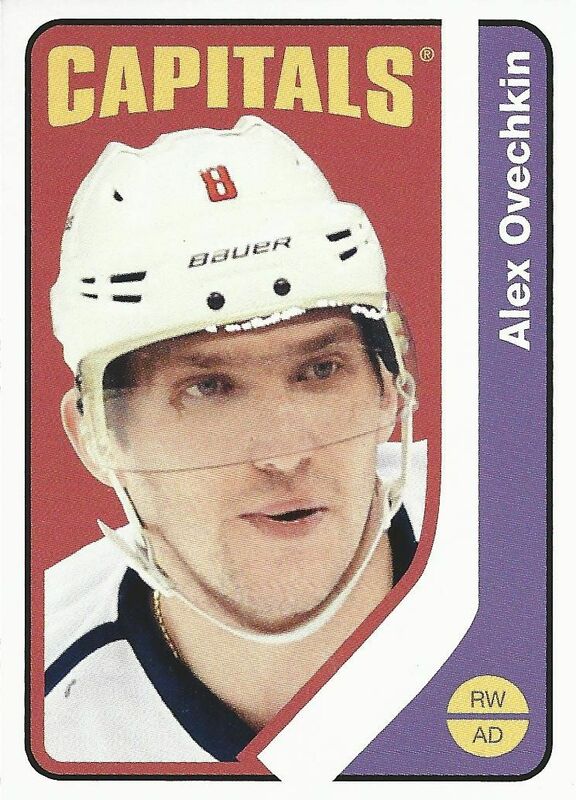 OPC retro cards have been hit or miss for me each year. This year I'd say they are not anything I'd pay any special attention to. 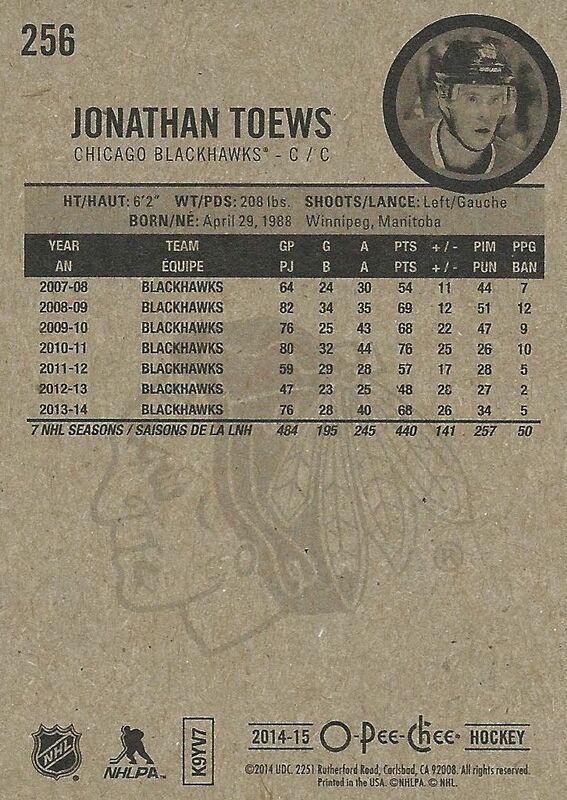 The cards are definitely minimalistic and have a retro quality to them, but overall they are pretty bland looking. Rookies and legend cards can also be found, and last year they looked different designs, but this year they don't vary as much from these standard retro looks. Foil parallels of the base set can be found this year. The foil used is similar to past iterations of OPC. It's a very shiny card that is so shiny you can see your reflection in them. These foil cards are not numbered, but should have interest for player collectors looking for more cards that are relatively easy to find. Black bordered foil cards serial numbered to 100 are another variation of the base set. The black border with the foil gives these cards a very sharp look. The rookie cards look especially good with the foil treatment. If there was one set out of OPC that I would like, it would be this one. Another favorite looking card are these OPC Sticker cards. Now these are what I call retro-looking! The two toned look from these cards really bring me back to the 70s and 80s. 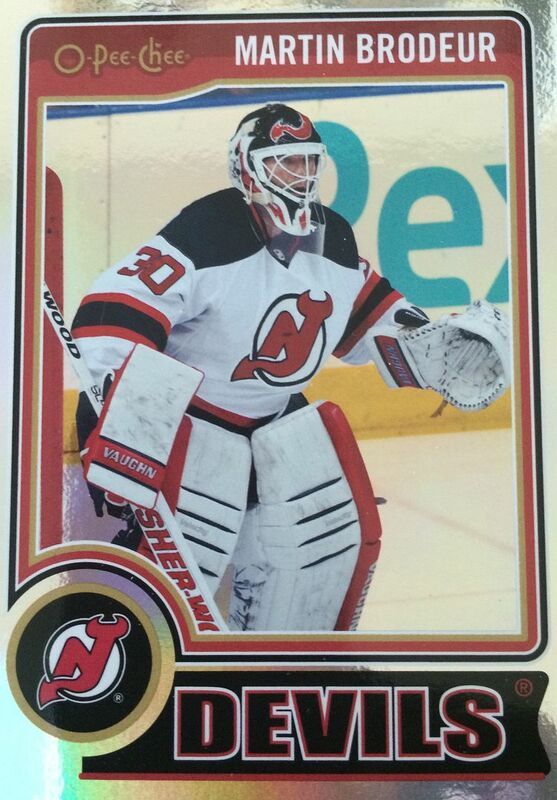 If Upper Deck had chosen this design to be the retro design, I think the retro set would have been more of a hit. These stickers are bold and in-your-face. It's a great design! Mini cards will pop out of boxes of OPC as well. These aren't the usually sized mini cards... these cards have an awkward rectangle shape that I haven't seen much of (or maybe at all). 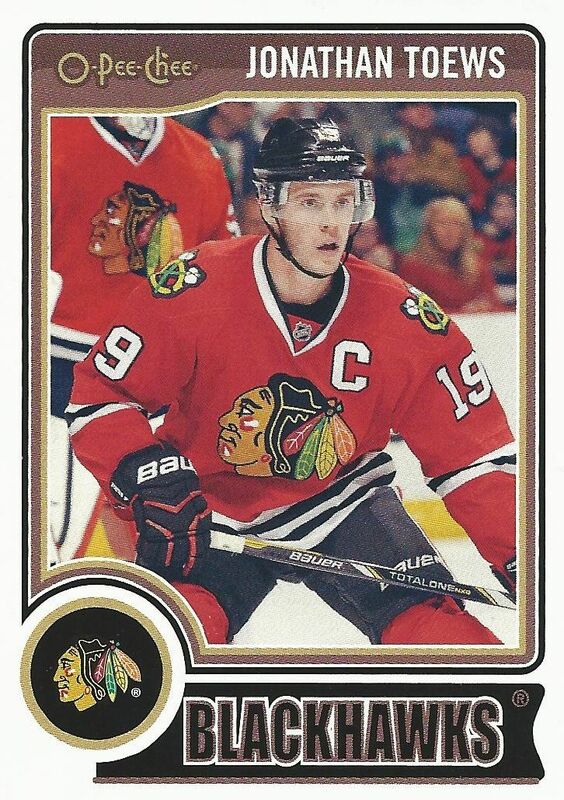 These cards feature head shots of players on a retro design. They may be interesting, but I don't see them holding that much collector interest. 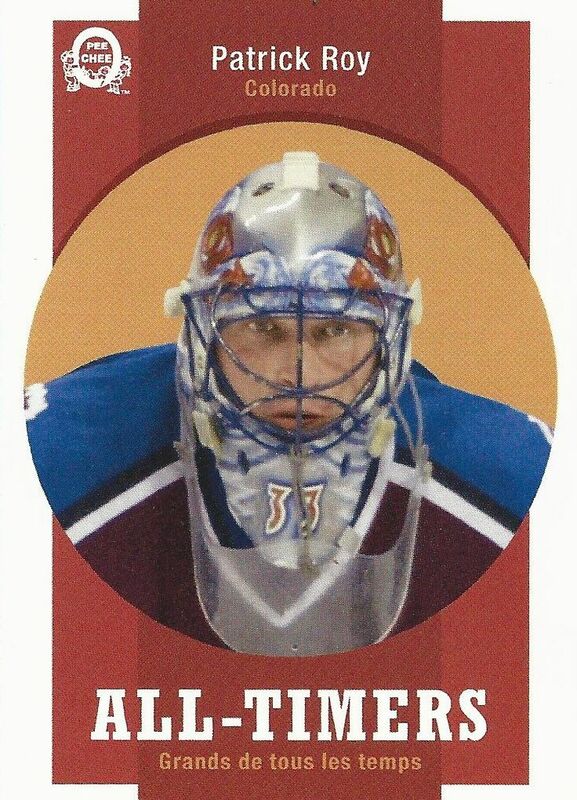 This All-Timers Patrick Roy card was an interesting pull from my box. It was the only glossy card from my entire box, so it definitely stood out from the other cards. This card has also been given a bit of retro treatment, but the design isn't memorable save for the old OPC logo in the upper corner. It's too bad that no hit or logo patch came out of this box, but that's to be expected when purchasing O-Pee-Chee. O-Pee-Chee has given collectors what it has given collectors for the past several years now - a large set to build and collect with plenty of variations to find. OPC is definitely on the lower-end, so don't get into it looking for memorabilia or autographs. It's not impossible to find hits, but it's just not a product that is worth the chase if you're going for those types of collectibles. OPC is a fun product for the retro collector. If you're someone who is concerned about building something big and getting as many NHL players as possible, OPC is the brand for you. It will definitely be a challenge tracking down all 600 cards. And you'll probably get a hit or two along the way as well for your troubles. Most people know what they're getting if they buy OPC - it's a cheaper product that gives you a lot of cardboard. Enjoy it for what it is! I like the desing of the cards ! I don't think they will worth something but i'l maybe get 1 or 2 boxes just for the look of the cards. Nice to see some lower end stuff for while. Cards look very traditional OPC which is only positive thing. I also like the variation in cards with retros, minis etc. Thanks for the video and review. Lots of inserts in that product! I love your review! It's the first one I've read of you, even though i've been following your youtube channel for a good while! I've been thinking of buying a hobby box of this for a while now (since it came out ;) ). You've helped me take my decision! I think i'll get one, even though there's a lack of hits in it... I love the base card so much! And the stickers (which I agree have a better retro frame than the retros...) remind me so much of my 81-82 complete set! Go check it out! I just started doing breaks! I also hope I win a card! It's a typical o-pee-chee product design but I like this years design more than last year. So far Upper Deck is not impressing me and I know they've only released their lower end products but man do I feel like they are on a lower level than the lower end brands from Panini. As the only manufacturer this year I feel like we should be getting better quality products than we've seen so far. That's just my opinion. I always enjoy O-Pee-Chee. I like to collect base sets and this is a nice one to go for. Nice All-Timers Patrick Roy! Nice break, although the collation of the sticker insert is as horrible in your hobby box as it was in mine, with them falling sequentially. But, it was just as bad in the blaster I tried. PS: Double-check that Heatley retro. 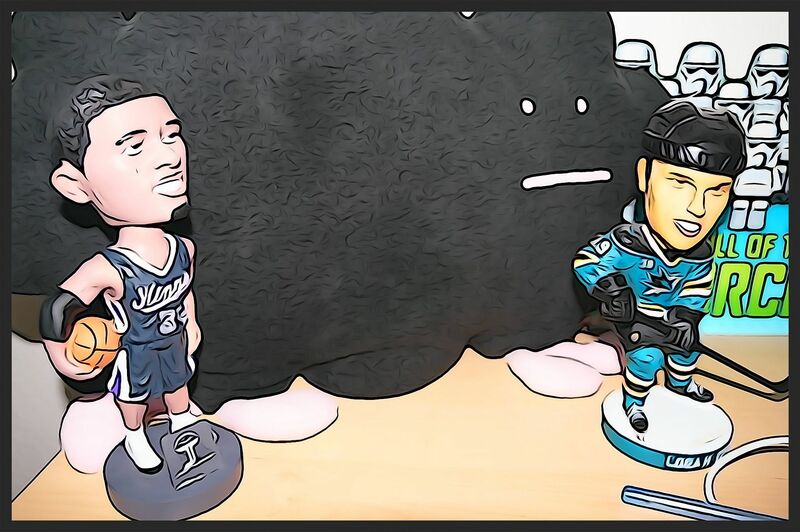 In one of my loose packs, there were two retros, and the one in that position was a blank back of Joe Thornton. They don't say what rate those fall at, but I talked to someone who busted 3+ boxes without finding one. Nice Box man, loved the video!